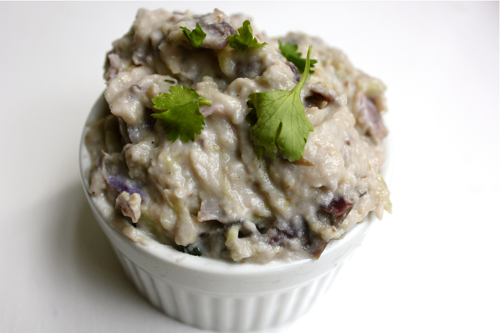 Baba ghanoush is a totally delicious eggplant dip, and it is really easy to whip together. When the creamy eggplant is flavored with olive oil, lemon, cilantro, and sesame, it turns into a healthy, tasty, and surprisingly filling snack. I’ll definitely be nibbling on it during the next football game. Traditional baba ghanoush is made with grilled eggplant, but you can cook your eggplant in the microwave for a speedier version. I had tiny eggplants, so I sliced them in half and steamed them in the microwave for 3-4 minutes. However you decide to cook your eggplant, do so until it is fork tender. 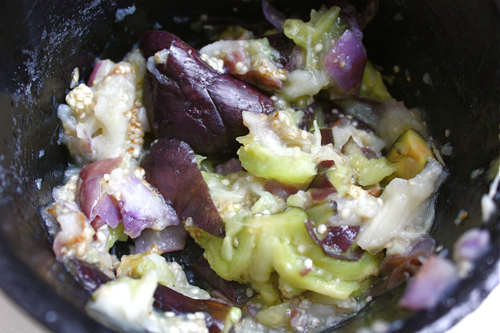 If you use a full-sized eggplant, you will want to scoop the insides out of the skin. My eggplants had thin skins because they were so tiny, so I left them on. I liked how colorful the skins made the final dip look. 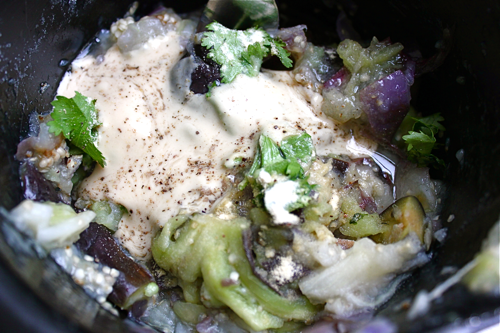 You can make your baba ghanoush in the food processor, but if you’re like me and don’t feel like creating a lot of dirty dishes, you can mash the eggplant by hand in a bowl. 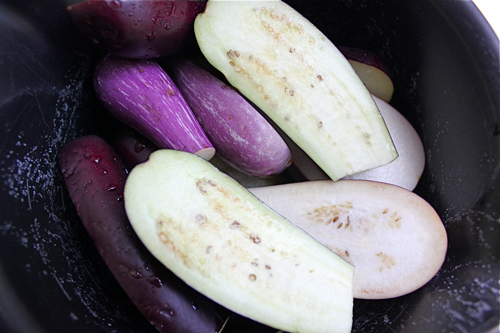 Run a sharp knife through the eggplant until it’s broken down into much smaller pieces. Don’t worry- it will take on a creamier consistency once you stir in the other ingredients. Now it’s time to season your eggplant. Drizzle in about 1 tablespoon of olive oil, some cilantro leaves, the juice from 1/2 lemon, 1 teaspoon of garlic powder, and 1 teaspoon of tahini. Tahini is sesame seed paste. I’ve made my own tahini before, but I definitely recommend buying it from the supermarket instead. Also season the baba ghanoush with salt and pepper. Stir the baba ghanoush well with a fork and taste it. Adjust your seasonings until the dip takes on the flavor you want. Eat your baba ghanoush with plantain chips, pita chips, veggies, or as a spread on a sandwich. I hope you enjoy this quick snack!